'Hostiles,' is it perhaps a solution to a problem? 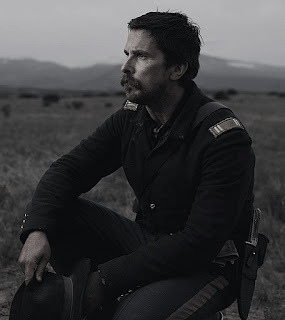 Its stunning opening sequence and shots of wide open spaces – men, women and a child on horses, silhouetted against the sunsets and sunrises in a film running for about 2 hours long, any aficionado of cinema, especially of the western genre, should be proud of watching Mr. Scott Cooper's new film. It is a character driven picture, with almost no action sequences, though it doesn't mean it's not brutal. The picture is well-paced, well-shot, written, directed and performed. And Mr. Cooper's attempt, as a director, at not glorifying violence is praiseworthy. In terms of making films, Mr. Cooper's slowly revealing, he's the name, one should be looking out for. His style is unique, I must say. If one has seen his previous work, it's safe to say, his take on a western, is not any different. Though, this one's a far bigger picture in terms of scope for him. And as any smart director, this being his fourth title, Mr. Cooper, it is with quite intelligence that he has decided to make this film today, for it's very normal nowadays for directors to jump from a smaller title to a big one immediately, all for the sake of not making cinema any better, if you ask me, but for fame and handsome paychecks. The list of those names can go on, but that's a discussion for a later time. Set in 1892, 'Hostiles' focuses on Joseph J. Blocker, a stern, dark-soul-man of duty, magnificently portrayed by Christian Bale, who is a captain counting the days to his retirement date, is suddenly under orders of the President, to embark on a perilous journey from New Mexico to the grasslands of Montana with his right hand men, escorting a dying Cheyenne war chief, limned by the legendary Wes Studi, along with his family. Though, Blocker has problems with that. He pronounces, the dying chief as a butcher and he has valid reasons for it to believe that. But orders are orders. Plus, Blocker's pension comes under question as well, when he confidently says so, that being court-martialed is not what he fears. Many believed, when the marketing of the film commenced, that the term, Hostiles, the title, referred just to the Natives. But that's not what the film focuses on, for it rather educates one that the film's title refers to man, man's beliefs, politics, wealth, desire, hunger, the reasons for which man is capable of violence. The picture further proves that man was always a hostile creature, and will always be. But the central theme of the picture is of importance – men coming to terms. Men comprehending each other. And that it's the hatred that needs to be buried. It's a perfect time, especially with what's going on in the world today to witness a film like this. And, America is very much part of that same world we speak of. Perhaps, 'Hostiles' is an answer to questions we're yet to ask ourselves, or it's a solution to the problems invented by man itself.